When perfection, satisfaction and quality matter to you. Then being trained by the best is important. Seka's Beauty Case @101 Darley Beauty Collective has over 20 years of Eyelash Extension experience from Classic to the most advanced Russian Volume. We offer life time training to all our students. When being trained be trained by only the best. Never settle for second best, it will affect your reputation and profitability. Let Sonja at Seka's Beauty Case @101 Darley Beauty Collective on Sydney’s Northern Beaches train you to become the best eyelash extension therapist and most sort after in a fast growing industry. This is where it starts for you!!! NOW!!!! Don’t wait any longer…….look to the future. Eyelash extension courses are held in Sydney at Seka's Beauty Case @101 Darley Beauty Collective. At Seka's Beauty Case @101 Darley Beauty Collective we teach Classic, and Russian Volume Eyelash Extensions application (2,3,4,5,6D). The courses in Sydney are never more than 2 students or private one-on-one training. Bookings are essential. We offer the best training to kick start your new career. Ring Sonja @ Seka's Beauty Case for more information. CALL US TODAY (02) 9979 5678 or 0412 121 548 FOR EYELASH TRAINING. We can tailor a training package to suit both you and your salon requirements, personal requirements and budget. All eyelash training course participants are certificated at successful completion of competency assessment. My Guarantee to you is after our course you will be able to confidently understand the concept of eyelash extension application. We take our courses very seriously in a professional environment as we expect our students to do the same. Become a therapist in one of the fastest growing industries in beauty therapy. Be trained by only the best! Eyelash extensions are enhancements designed to add length, thickness and fullness to natural eyelashes. They are now one of the fastest growing salon services provided, worldwide. At Seka's Beauty Case @101 Darley Beauty Collective on the Northern Beaches, we train you to become the best eyelash extension therapist available. Our products, training and technical support are first class and you will be trained by only the best in the industry. The best eyelash extension course on the Northern Beaches. Our Eyelash Extension Courses are delivered by highly skilled professionals, who have a wealth of experience, and will provide you with skills and confidence. Our Eyelash Extension Training packages are tailored to suit your requirements, convenience and budget. We are the experts in Eyelash Extension Training and we want our trained technicians to have all the knowledge and expertise required not only to apply the lashes with the correct technique, but also to be able to start their own professional practice. Through our Eyelash Extension Courses courses, your clients will be able to achieve the natural or glamorous look they have always desired for every occasion. At our salon on the Northern Beaches, we also provide follow up technique perfecting training workshops to constantly improve your skills, which are held once a month. With our training you will certified once you graduate. Once you graduate you will be 100% salon ready stylists who will be capable of precise extension applications and be well educated in all the terminologies and techniques used in the field. Our training will teach you how to use eyelash extension products correctly to achieve the ultimate look. Our Eyelash Extension Courses at our salon on the Northern Beaches consist of a maximum of 2 students at a time. At the end of the training course, not only would you have perfected the art of applying eyelash extensions but you will also be able to get back the confidence of your clients by accentuating their eyes and adding stunning density to their natural lashes. We also offer one on one training. Come train with us and become the best eyelash extension expert in the industry! You may choose to do an extra days training for either of the course at $1000 per day for each student. Seka's Beauty Case @101 Darley Beauty Collective training courses are all held in our Salon, which are located on Sydney’s Northern Beaches. Training at beauty salons is available in Sydney and interstate, although a surcharge will apply for all travel costs relating to the training. Perfects the technique of the eyelash extension application, infills and dissolving – 7 hours of practical and theory training. 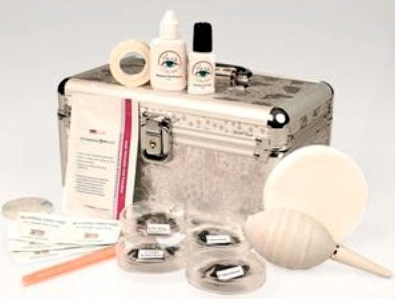 Cost - $700 (model provided) – includes eyelashes, glue, glue remover, tape and tweezers on the day of training. *Seka's Beauty Case @101 Darley Beauty Collective will supply eyelashes, glue, glue remover, tape and tweezers on the day of training. Perfects the technique of the Russian Volume eyelash extension application, in-fills and dissolving – 7 hours of practical and theory training. Cost - $1000 (model provided) – includes eyelashes, glue, glue remover, tape and tweezers on the day of training. Beginners perfect the technique of classic eyelash extension application, infills and dissolving – 8 hours of practical and theory training. Perfect the technique of the eyelash extension application to suit the needs of all your clients. 1st day - 5 hours of practical and 1 hour of theory + 2 hours practical for in-fills and troubleshooting. Perfect the technique of the eyelash extension application to kick start your new career. Beginners perfect the technique of classic eyelash extension application, infills and dissolving, lower lash extensions, introduction to Russian Volume – 8 hours of practical and theory training. Perfect the technique of the eyelash extension application to suit the needs of all your clients. 1st day - 5 hours of practical and 1 hour of theory & 2nd Day - 5 hours practical including in-fills and troubleshooting. Perfect the technique of the eyelash extension application to kick start your new career + introduction to your advanced career introducing you to Russian Volume Eyelash Extensions. Advanced technicains perfect the technique of Russian Volume eyelash extension application, infills and dissolving, lower lash extensions, 12 hours of practical and theory training. Perfect the technique of Russian Volume eyelash extension application to suit the needs of all your clients. 1st day - 5 hours of practical and 1 hour of theory + 2nd Day 6hours practical and 1 hour of theory. Perfect the technique of the Russian Volume eyelash extension application to advance your career. Perfect the technique of the classic and Russian volume eyelash extension application to suit the needs of all your clients. 1st day - 5 hours of practical and 2 hour of theory + 2 day - 8 hours practical, in-fills, lower lash application and troubleshooting. On completion of training and successful assessment of eyelash extension application your Certificate will be issued. Students are required to have good eyesight and hand eye co-ordination and bring visual aids as poor eyesight will hamper the practical training. Seka's Beauty Case @101 Darley Beauty Collective training policy is that all students are required to purchase a Seka's Beauty Case @101 Darley Beauty Collective Eyelash Extension Kit to attend the training. It is imperative that the correct tools are used. All students will be taught how to use the tools and implements in your kit. 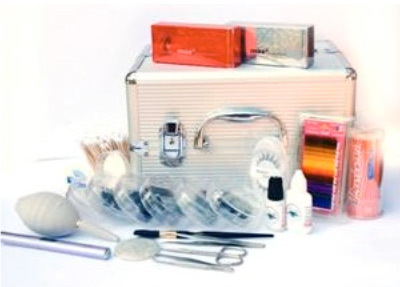 For therapists with existing kits it will be necessary for you to bring your tools to training if you desire and you may purchase a product only kit and Seka's Beauty Case @101 Darley Beauty Collective will supply implements and tapes. We ask that students be punctual. Course Payment: 70% deposit of course fee is required and 30% 7 days prior to course. Refund Policy:Cancellation 7 days prior to workshop is a non refundable deposit. We do our best to accommodate any unforeseeable circumstances and we offer the option of transfer to one other training date with a $100.00 transfer fee. No cancellation accepted for the second date deposit fee applies.